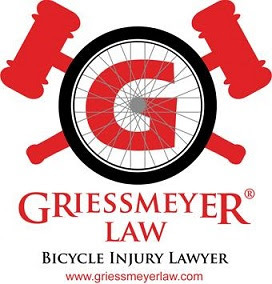 What is worse, taking away the license of someone, or a bicyclist getting injured or killed by a driver with prior accidents due to known medical conditions that make the driver unable to drive safely? In Wisconsin, a driver license can only be immediately cancelled when a medical professional (MD, DO, PA-C, or APNP) reports or supplies information to the Department that indicates a person is unsafe to drive using a Medical Examination Report form MV3644. 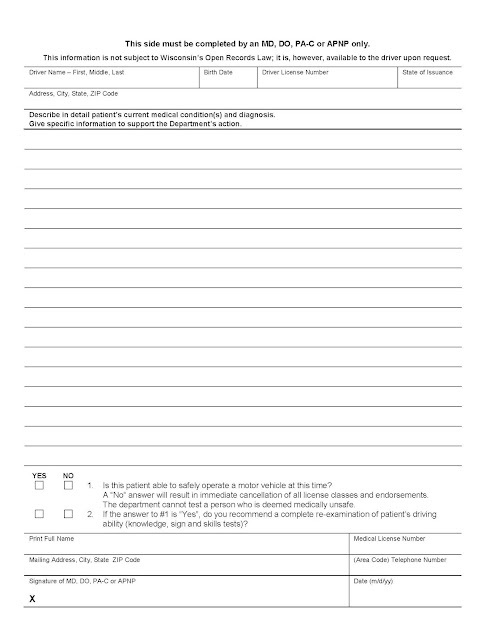 The form is only acceptable when completed in full and signed by a Doctor of Medicine (MD), Doctor of Osteopath (DO), Physician Assistant (PA-C) or Advanced Practice Nurse Prescriber (APNP) and must be based on an examination conducted within the past three months, unless otherwise directed by the Medical Review Unit. Health care professionals are protected from liability for reporting potentially unsafe drivers to the Department pursuant to Wisconsin Statute 448.03. Doctors in Wisconsin are not required to report unsafe drivers. This means that a doctor can be aware that his or her patient has been involved in multiple accidents with injury due to medications or other health conditions and still not report the patient. Unfortunately there are drivers on the roads that cannot drive safely due to known medical and other conditions. These drivers pose a serious risk to bicyclists/ vulnerable users of the roads. "Do medical professionals report unsafe drivers? They can. But, Wisconsin does not have a mandatory reporting law, but a physician, physician assistant or APNP may report concerns about a patient's driving ability to WisDOT without informed consent of the patient. This applies to anyone whose physical or mental condition may affect his/her ability to safely operate a motor vehicle, based on the health care professional’s judgment. Reports from health care professionals are considered confidential because they contain medical information. However, the information is available to the driver. If you are concerned that someone should not be driving due to medical or other impairment, you should report them before that person injures or kills somebody. A private citizen can report dangerous drivers under certain circumstances. Under some circumstances the DOT could cancel the person's license. If you report a driver you should keep a copy of the report for your records. That way, if nothing is done and the driver keeps driving and later injures or kills someone, there is a record of the report. Unfortunately, governmental bodies in Wisconsin have immunity under most circumstances and therefore it is difficult to hold them accountable even if they completely disregard the report of the unsafe driver. 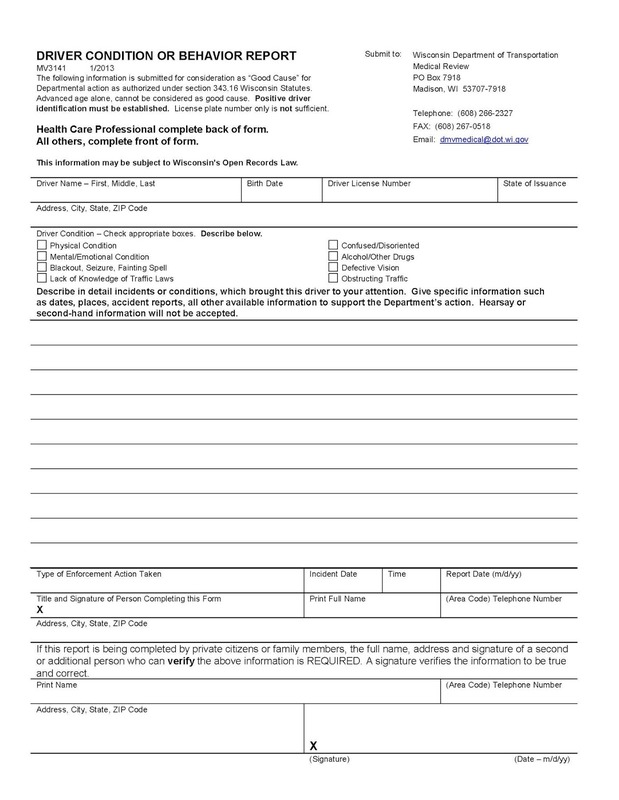 Below is a copy of the report form from the WI DOT also found here.